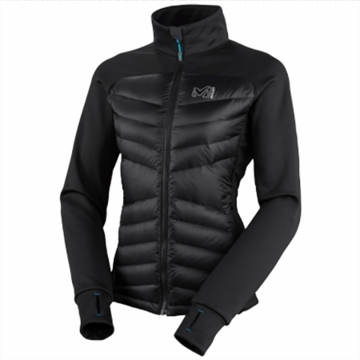 The smart and comfy Millet Women's LD Touring Hybrid Down Jacket puts stretch and down insulation right where it's needed most. This lightweight thermal shell features a hybrid design, wtih Thermostretch at the shoulders, arms, and back and toasty-warm European duck down in front. The fit is women-specific and ergonomic for easy, natural movement. The wraparound collar adds cozy comfort to your otherwise exposed neck. Wear this jacket alone on mild days or on epic ascents that make you sweat or with a shell for extra cozy comfort.